Casa do Hibisco is located on a small farm in São Pedro do Estoril. This farm, acquired in 1940 for the production of carnations, is in the family for 4 generations. The house owes its name to a more than 50 years old hibiscus planted next to the entry. Surrounded by trees, the house is quiet and comfortable, with a green outdoor area. 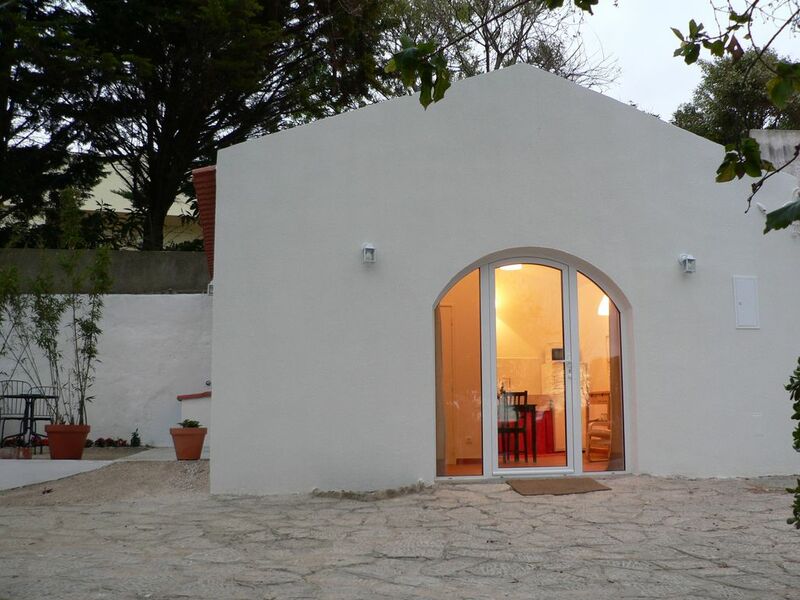 Near the beach, this house is a good choice for people who want to visit Lisbon , Cascais and Sintra. Completely renovated in 2016, the house combines comfort with a rustic style. It has one bedroom with a traditional Portuguese iron bed, a living room with a kitchenette fully equipped with a fridge and stove, and a bathroom with shower. The floor in traditional Portuguese tiles contrasts with the large glass door with plenty of natural light, which allows a continuity between the house and the garden. In the property, there are some other houses, where the hosts live. There are several friendly dogs, cats and chickens.The house has a private outdoor space, where guests are invited to enjoy a peaceful environment. Smoking allowed in the outside area. Delightful! Perfect for my needs. Spotless, well-equipped, comfortable, relaxing, wonderful hosts. I could go on and on and maybe I will. This flat served all my purposes; near enough to Lisboa with easy access to the train, parking (on street) for the car and day trips, convenient grocery shops, restaurants ( O Mira was great), afternoon naps, evenings on the terrace. Beach in walking distance but don't expect warm water! It is the Atlantic Ocean after all. Lovely evenings chatting with Afonso and Ana, throwing the ball for Cacau, tickling Joao's toes and much more. Dinner of Presunto, cheese and some figs from the trees in the garden (ask Afonso first before foraging). I can't have asked for more and will return on my next trip to Portugal. We are very happy to read these words. See you soon! looking forward to it! Casa do Hibisco is a great place to base yourself if you want to explore this part of Portugal. Afonso is a great host. Very welcoming and approachable. The house is really cute and fitted out for everything you’d need. The gardens are lovely and the whole place feels really serene. I’d absolutely recommend it. Wish you all the best and see you soon! Just as advertised, immaculately clean, very secure and convenient to trains. This I a very beautiful farm in a relatively empty dead end street. We were surprised how built up this section of the coast is. We thought it would more rural. Caiscas (Fado and hiking) and Belem (museums) were our go to cities, and Baco de Roca and Sintra for hiking. Best were Ana and Afonso, who had a new baby Juan, while we were staying, and were most helpful with all our needs. We thank them for letting us stay at this wonderful rental. Thank you for your warm and kind words. All the best and see you soon! Case do Hibisco is a sweet little appartement that serves all your basic holiday needs. It's clean and fresh inside with all the facilities required to cook as you much or as little as you decide to. Whilst the apartment is small, we had plenty of space for two adults and a toddler, anything more would be a squeeze with less space and furniture to go around. Afonso is a great host and did everything to make our stay easy and comfortable. He had great advice and recommendations for dinner, drinks, the weather, getting around etc... he even met us at the train station to guide us over! The location is really central to go to many places even to get down and walk along the coast into Cascais, provided you don't mind a short walk to the local train station - from there you can get everywhere very easily. Thank you for your words! looking forward to see you again! As our hosts, Afonso and Ana were gracious, caring and extremely helpful with everything and went out of their way to assist us with every detail of our stay at Casa do Hibisco. Accommodations are clean, comfortable and closely situated to both the train station and the Ocean. It only takes a few minutes to walk to the ocean and also to the train station. You can be in Lisbon in about 20 minutes for a couple of Euros. Much more desirable for us than staying in the city. The setting of Casa do Hibisco is beautiful and is steeped in impressive history and surrounded by wonderfully fragrant flowers and trees. Cant say enough good things about Afonso and Ana and Casa do Hibisco. Highly, highly recommended. Thank you Afonso and Ana. Dear Nick and Jenny thank you for your kind words! We look forward to see you again! We have during our stay at Casa do Hibisco experienced the Portuguese hospitality. Host Afonso does everything to make your stay as pleasant as possible. The House offers all the comfort you need and privacy to ensure a pleasant stay. With the station at just a 5-minute walk, Lisbon is neer by. Wi-Fi access is excellent. Anyone looking for a quiet and pleasant stay we can recommend Casa do Hibisco. It was very nice to have you here with us. Thank you for your kind review. It means the world for us!